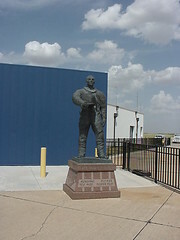 The Thomas P. Stafford Statue was in Heritage Park across from City Hall, Weatherford, Oklahoma, but it is now at the Air and Space Museum by the Airport. 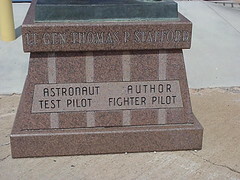 Thomas Patten Stafford (born September 17, 1930) is an American astronaut and Air Force general. 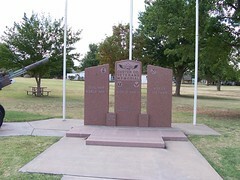 Stafford was raised in Weatherford, Oklahoma. He went on to graduate with honors in 1952 from the U.S. Naval Academy, Annapolis, Maryland, and was commissioned a second lieutenant in the United States Air Force. He received his pilot wings at Connally AFB, Waco, Texas, in September 1953. He completed advanced interceptor training and was assigned to the 54th Flight Interceptor Squadron, Ellsworth AFB, Rapid City, South Dakota. In December 1955 he was assigned to the 496th Fighter Interceptor Squadron, Hahn Air Base, Germany, where he performed the duties of pilot, flight leader, and flight test maintenance office, flying F-86Ds. He was an instructor in flight test training and specialized academic subjects-establishing basic textbooks and directing the writing of flight test manuals for use by the staff and students. He is co-author of the Pilot's Handbook for Performance Flight Testing and the Aerodynamics Handbook for Performance Flight Testing. Stafford was selected among the second group of NASA astronauts in September 1962 by the National Aeronautics and Space Administration (NASA) to participate in Projects Gemini and Apollo. 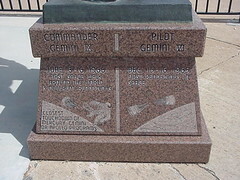 In December 1965, he piloted Gemini VI during the first rendezvous in space, and helped develop techniques to prove the basic theory and practicality of a space rendezvous. In June 1966 he commanded Gemini IX and performed a demonstration of an early rendezvous that would be used in Apollo 10: the first optical rendezvous; and a lunar orbit abort rendezvous. From August 1966 to October 1968 he headed the mission planning analysis and software development responsibilities for the astronaut group for Project Apollo. Stafford was the lead member of the group, which helped formulate the sequence of missions leading to the first lunar landing mission. He demonstrated and implemented the theory of a pilot manually flying the Saturn booster into orbit and the translunar injection maneuver. 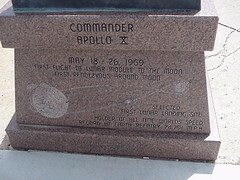 Stafford was commander of Apollo 10 in May 1969, which included the first flight of the lunar module during a Moon orbit, the first rendezvous while in the Moon environment, and the entire lunar landing mission except for the actual landing. He also did reconnaissance and evaluation of future landing sites for Apollo 11. Stafford and his crewmates were cited in the Guinness Book of World Records for the highest speed ever attained by man—during Apollo 10's return from the moon, the spacecraft reached 24,791 statute miles per hour. He was assigned as head of the astronaut group in June 1969, responsible for the selection of flight crews for projects Apollo and Skylab. He reviewed and monitored flight crew training status reports, and was responsible for coordination, scheduling, and control of all activities involving NASA astronauts. 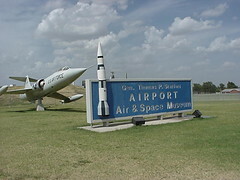 In June 1971, Stafford was assigned as Deputy Director of Flight Crew Operations at the NASA Manned Spaceflight Center. He was responsible for assisting the director in planning and implementation of programs for the astronaut group, the Aircraft Operations, Flight Crew Integration, Flight Crew Procedures, and Crew Simulation and Training Divisions. Also in 1971, Stafford served as a pallbearer for the Cosmonauts of the ill-fated Soyuz 11 mission, where all three Cosmonauts died during reentry due to a faulty valve. 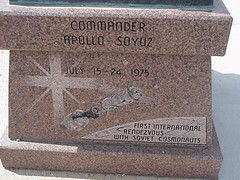 He logged his fourth space flight as Apollo commander of the Apollo-Soyuz Test Project (ASTP) mission, July 15-24, 1975—a joint space flight culminating in the historic first meeting in space between American astronauts and Soviet cosmonauts. General Stafford was the first member of his Naval Academy Class of 1952 to pin on the first, second and third stars of a General Officer. 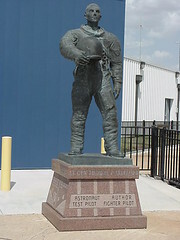 He made six rendezvous in space; logged 507 hours in space flight; and wore the Air Force command Pilot Astronaut Wings. He has flown over 120 different types of aircraft and helicopters and four different types of spacecraft. 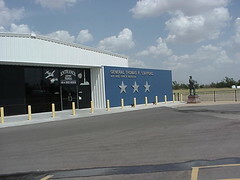 General Stafford assumed command of the Air Force Flight Test Center November 4, 1975. He was promoted to the grade of Major General August 9, 1975, with date of rank of June 1, 1973. Promoted to grade of Lieutenant General on March 15, 1978, he assumed duties as Deputy Chief of Staff, Research Development and Acquisition, Headquarters USAF, Washington, D.C., on May 1, 1978. He retired from the Air Force in November 1979. In June of 1990, Vice President Quayle and Admiral Richard Truly, then NASA Administrator, asked General Stafford to chair a team to independently advise NASA how to carry out President George H.W. Bush's vision of returning to the Moon, this time to stay, and then go on to explore Mars. General Stafford assembled teams of 40 full-time and 150 part-time members from the DOD, DOE and NASA, and completed the study called "America at the Threshold", a road map for the next 30 years of the U.S. Manned Space Flight Program. General Stafford and Vice President Quayle held a joint Press Conference at the White House in June 1991 to announce the recommendations to the public. He co-founded the Technical Consulting Firm of Stafford, Burke, and Hecker, Inc. in Alexandria, Virginia. He sits on the Board of Directors of six corporations listed on the New York Stock Exchange, one listed on the American Exchange, and two others, including Seagate Technology, Inc. Seagate Technology is the largest independent hard disk drive maker in the world. He has served as an advisor to a number of governmental agencies including NASA and the Air Force Systems Command. He was a defense advisor to Ronald Reagan during the 1980 presidential campaign and a member of the Reagan transition team. He served on the National Research Council's Aeronautics and Space Engineering Board; the Committee on NASA Scientific and Technological Program Reviews, and Vice President Quayle's Space Policy Advisory Council. He was Chairman of the NASA Advisory Council Task Force on Shuttle-Mir Rendezvous and Docking Missions, and the NASA Advisory Council Task Force on ISS Operational Readiness. 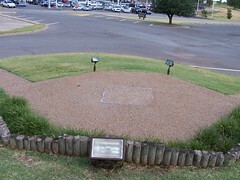 Heritage Park, (1.2 ac) located across from City Hall. 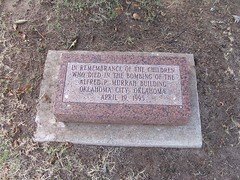 Contains: Tom Stafford Statue (Move to Air & Space museum), Veterans Memorial, Memorial Tree: Murrah Bombing. 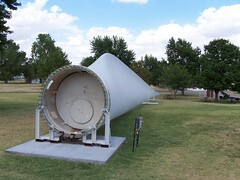 April 19.1995, windmill blade from Wind power farm.